Hello! 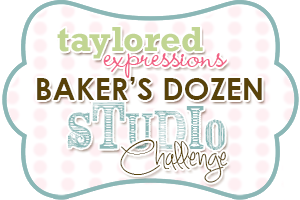 It's time for the June Taylored Expressions Baker's Dozen Studio Challenge. This is a monthly opportunity for us to share what makes our stamping studios hum. 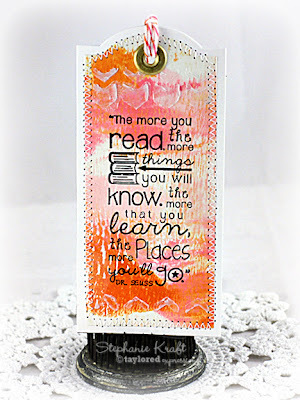 Each month we have a fun, crafty question so we can share our favorites, some tips and tricks, stamping advice and more. What's on your summer reading list? Are you a big reader or not? If you are, what books have you read lately that you would recommend? Do you have a favorite author or genre? How about something for sitting out by the pool, or the beach, or even just the backyard...some nice light summer reading? Do you use fancy bookmarks or do you dog-ear your pages? Or, do you use an e-reader? 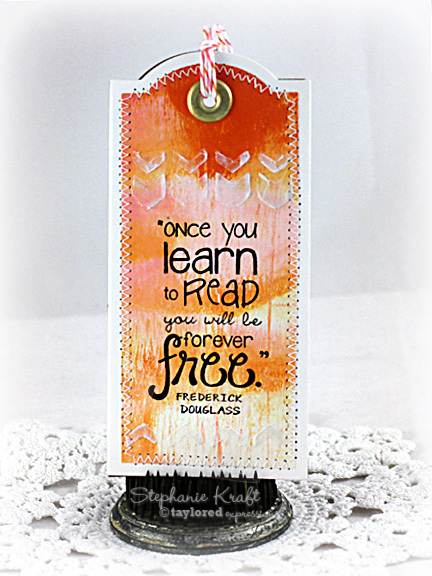 Everyone can use bookmarks and they make great favors and gifts. Let's see a little inspiration! I LOVE to read, and I read any chance I get. I read a little of everything from science fiction/fantasy (Robert Jordan, George R.R. Martin) to dystopian (Hunger Games) to mystery to the Twilight series! One of my favorite authors is R.A. Salvatore, and I am currently reading his Neverwinter Saga. I like to read books in a series, though I have to admit that it is hard to wait a year or more for the next book to be released. Ideally, I'd like to start a series once all of the books are available. Of course, that's not always possible. If that is the case, I've been known to re-read a series once all of the books are available! I mostly read books on my iPhone, using either the iBooks or Kindle app. I took this opportunity to make bookmarks for Sabrina's summer school teacher and aides. I started by making my patterned paper with the Gelli Arts gel printing plate. I mixed a few shades of pink, an orange and cream paint. I didn't want to add a lot of bulk to the bookmarks, but I did want to add a little something, so I used the Chevron Cutting Plate to cut out a stencil and added a few Chevron rows with molding paste for some subtle texture. 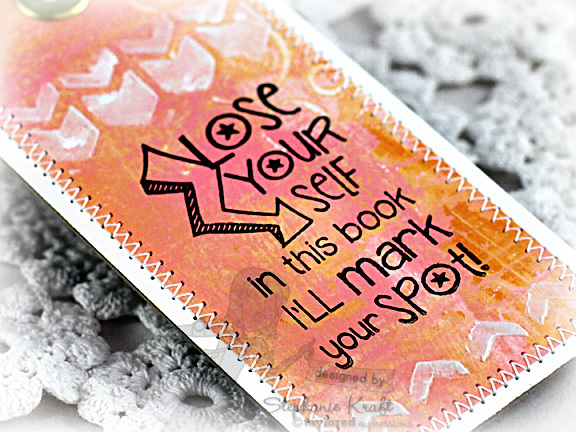 Each bookmark features a different quote from Mark Your Spot. I used Banner Stacklets 2 for my top layer and matted it with the next largest size. After adhering my patterned paper to a Choice Snow White layer and stitching, I adhered both layers to a thin piece of chipboard so that my bookmarks would be sturdy. I then added a gold eyelet to the top of each and some orange and pink Divine Twine. Accessories: Taylored Dies: Banner Stacklets 2, Chevron Cutting Plate (Taylored Expressions); Divine Twine, Brads (WRMK), Acrylic paint, Molding paste, Red line tape, Thread, Sewing machine. These are so pretty, Stephanie! 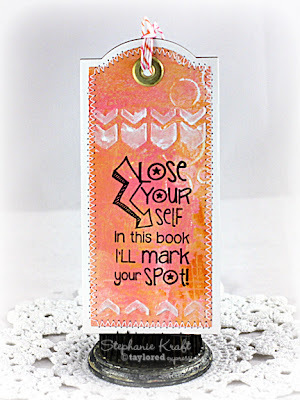 I just love the bg you created with the Chevron Cutting Plate! SOOOOOOOOO cool! Love that molding paste technique - very neat. Also loving that color scheme - really fresh! Awesome bookmarks Stephanie! Stephanie, these are GORGEOUS! 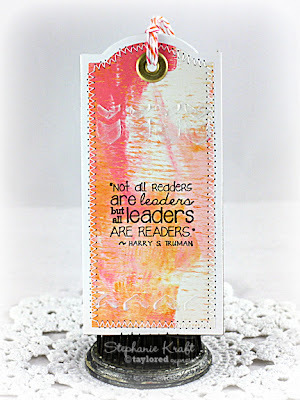 Love your colors and the molding paste technique...so awesome! Wow Stephanie! I LOVE your beautiful bookmarks! Great mix of colors and the stitching around the edges looks fabulous! Gorgeous bookmarks, Steph!! Love them! Wow - these are FANTASTIC, Steph! I want to learn more about the Gelli Arts gel printing plate. That's totally news to me, but OMG - how gorgeous!!! 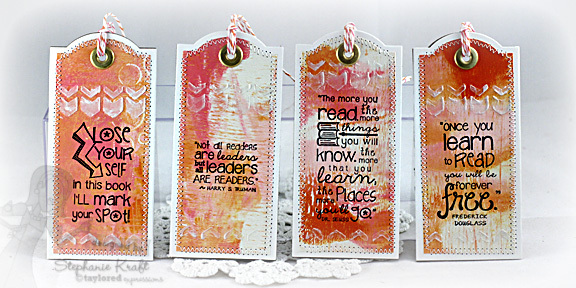 These are so pretty and artsy, Stephanis...love how you added a little texture with the cutting plate and Gelli arts gel...mixed media at it's best!!!! Stephanie, I love these mixed media bookmarks. I've just started playing with my Gelli plate and adore everything you can do with it! Love your color combinations here too. What perfect gifts for teachers! It seems we have the same taste is books as well. The Wheel of Time series is one of my favorites of all time!! I love love love these! I would have never thought to stamp bookmarks--how brilliant!! These are possibly the cutest things ever!